We’ve mentioned in the past how using BOSS to outsource your accounting services can lead to an immediate increase to 42% profit. But there’s a big question associated with such a boost to your profit numbers – can your business handle the growth potential outsourcing accounting provides? Believe it or not there are some pitfalls that, if you’re not prepared, can possibly cause your business to get stuck with a bottle neck internally. Problems arise when the Partners don’t first look at the numbers and processes that make up the internal workings of their firm. What we mean is this – you may leap at the chance for that increase in profit. You outsource your accounting services, freeing up all sorts of time. You use that time and additional profit to ramp up your marketing to rake in a huge number of new clients and extend your value-add offerings. But you and your staff have no experience with handling this new volume internally. Even though a lion’s share of the work can be sent overseas, there’s still work that has to be done in-house. Info required overseas gets delayed. Jobs get backed up at your end (either at the beginning, query or final review stage). In-house staff struggle to keep up. Relations with existing clients can be affected. Before you flip the switch on outsourcing your accounting services we strongly suggest you make sure that your in-house team’s processes are both running as efficiently as they can now, and are ready to scale up. Don’t put your processes before your goals. The goals are more revenue, new clients and satisfied clients. But your current processes may not allow those goals to be readily achieved. You have to be willing to change your processes to fit the new paradigm of outsourcing accounting work. There will be an increase in jobs processed (data prepared for the outsourcing provider, queries needing answering, more jobs to review), new clients won (admin, meetings etc. ), more business advisory work needed and probably more marketing activities now you have a reliable, quickly scalable compliance resource you can easily outsource accounting work to. So if you insist on squeezing all this through your current internal system you may find things get stuck in a bottle neck and the whole process starts disintegrating. You also need to learn from your staff what parts of your existing system are not working well. Staff at the coal face will have plenty of valuable insight into how to do things better. You need to allow tweaks to be made and allow time for evaluation of work flow and a forum for feedback so your organisation can continually evolve systems and procedures. You also need to appreciate a procedure may need regular refinement or overhaul. So, be flexible in your processes, not in your goals. When outsourcing accounting work you should ensure all data from the client is collected before handing over the job. Making this a standard practice considerably cuts down on the amount of back-and-forth you have with your BOSS team. BOSS provides a checklist easy enough for an Administrator to follow. Make sure you leverage your staff as much as possible: Administrators should prepare data, chase clients for query answers and prepare the final presentation for the client. 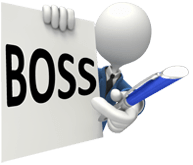 Accountants should provide BOSS with a brief of the client and job, handle the technical queries and review the job (if BOSS has not been tasked with a “first review”. A Partner should conduct a Partner level review and sign off the job. More time free to deal face-to-face with clients. A more efficient process means happier clients, which means more referrals. An influx of (referral) clients with no money yet spent on marketing. Outsourcing your accounting services can generate huge profit for your firm. But it’s not quite just a gift to be opened – you do have to put some effort into preparing your firm for evolving to its next level. But BOSS has eleven years of helping clients so when you engage us we can provide plenty of help!